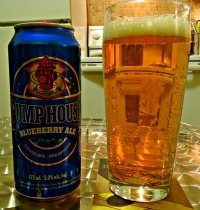 "Blonde coloured ale with the wonderful essence of fresh blueberries. Sweet flavours of peppery blueberries, malts and spicy hops make this one a winner all the way. A one-of-a-kind refresher." Straw coloured with a light one finger head and mild carbonation. 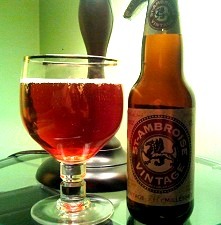 Mild and lagery malt nose with hints of blueberry that get stronger in jammy sweetness for a nice balance. 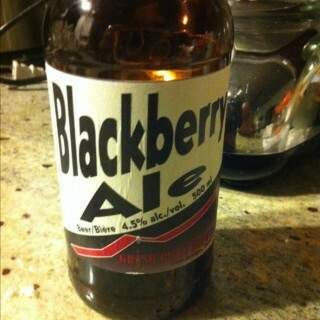 I'd compare it to Grand River's Blackberry Ale which was a favorite summer refresher of mine last year. Cream ale smooth with some decent carb bite. Has the mouth-feel and flavouring of a cider without the cloying sweetness. The nose leads to a pleasant quenching bite off the sip that obligingly makes way for the next. This one's kind of hard to judge since it's prime season for consumption isn't quite upon us. I find flavoured beers are also a tough category since many have trouble balancing their flavours; I find many watery with an overwhelming artificial taste. This brew is a nice warm weather surprise. It's not outstanding in it's style but it grows on you and is definitely a gateway beer for the ladies. I give it a B.